Again essential to Numicon is the belief that because number ideas are so abstract and complex, most children will need to develop them in very small steps. As adults who encountered these ideas long ago, most of us have forgotten just how many times we felt puzzled or simply lost before we gave up and just learned 'how to do sums' without having much of a clue as to what it all meant. The Numicon programme of activities has been developed from innumerable experiences with children in which they have shown us exactly how small many of the steps need to be. It is important that every child meeting Numicon for the first time learns the Foundation activities. As the name suggests, these help children to establish the foundation for success in number. All the materials needed for teaching the Foundation activities are included in the Numicon Foundation Kit, including twelve double-sided, illustrated activity cards which explain the teaching activities. The activities are designed to build up children's skills in small steps. In her recent book, Nye gives helpful suggestions for adapting the activities to the specific needs of children with Down syndrome. Nearly all the activities are designed as games so there is lots of opportunity for turn taking and naturally showing the child what to do when the adult takes a turn; helpfully this means that the activities play to the social strengths of children with Down syndrome. Mathematical language is difficult for all children, so the language that can be developed through each activity is shown clearly on the cards. 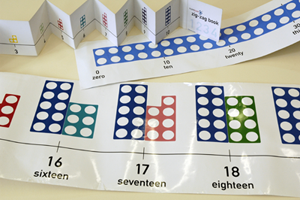 Of course Numicon is only part of the child's experience with numbers, so on each of the activity cards there are suggestions for making connections with other activities that reinforce the learning and help the child to use and apply the new understanding. Importantly, from the very beginning, children need to be learning and practising their counting alongside all Numicon activities. Children are now ready to move on to Numicon Kit 1 which relates to the English National Curriculum Levels 1 and 2 and the Primary Numeracy Strategy. To check their children's progress and follow through the teaching programme parents can refer to the Numicon Assessment Signposts and Record of Progress, available from Numicon at a cost of £12.50. 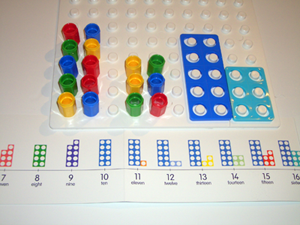 It is in Numicon Kit 1 that children begin to gain sufficient mathematical understanding to start to understand money and work with simple measures. In Kit 2 children start to work with higher numbers and so are ready to work on measuring in metres and centimetres, litres and millilitres. The Kit 2 work on introducing fractions and multiplication builds the skills children need for learning to tell the time with understanding. Parents and teachers often ask 'how long will it take to do the Foundation activities?' and of course this will vary hugely from child to child, depending on age and previous experiences as well as aptitude. Older children coming to Numicon for the first time will sometimes move through the stages quite swiftly, some very young children may take three years or more to cover them. What is important to remember is that learning is not a race, every step is significant and is to be celebrated and practised so that children build confidence and positive attitudes. When children enjoy what they are learning they are very likely to be successful. Parents of children with Down syndrome support one another in the use of Numicon through their local associations and there is also a very helpful international discussion group where parents share their successes and questions numiconz@yahoogroups.com . Numicon has five training consultants who specialise in Down syndrome, and full details of the training is available from info@numicon.com . 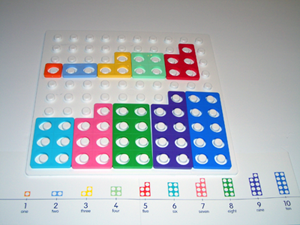 The Numicon approach first began to be developed in 1996 (with UK government funding) by practising teachers in mainstream schools as an approach that would support children of all ages and abilities, and success was quickly shown in dramatically improved SATs scores across the whole ability range . 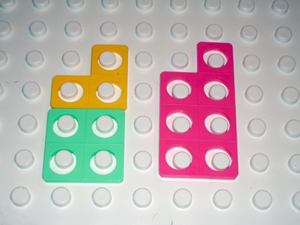 Between 2001 and 2006, supported and scrutinised by their educational psychology services, Wiltshire , Leeds , and Brighton and Hove  LEAs have all independently undertaken teaching programmes based upon the Numicon approach for children who were not succeeding with their school mathematics. Using standard psychological tests to measure results, all studies showed notable improvements in both children's scores and also very importantly in their personal confidence and attitudes to number work. Currently Cambridge and Doncaster LEAs are also trialling the Numicon approach with children with special educational needs, and are reporting very encouraging initial feedback (including again, significantly increased personal confidence in children) informally. The English National Curriculum Key Stage 1 is for pupils aged 5-7 years, Key Stage 2 for 7-11 years, Key Stage 3 for 11-14 years and Key Stage 4 for students aged 14-16 years. The programmes of study also map out a scale of attainment within the subject. In most Key Stage 1, 2, and 3 subjects, these attainment targets are split into eight levels. By the end of Key Stage 1 (aged 7), most typically developing children will have reached level 2, and by the end of Key Stage 2 (aged 11), most will be at level 4. Five of the team of Numicon consultants who undertake training in the use of the approach are experienced in teaching children with Down syndrome and three of them are themselves parents of children who have Down syndrome. All the Numicon consultants are, like the authors, formally qualified teachers with a great deal of successful experience teaching mathematics in schools, with one exception - Dr Joanna Nye (formerly at Down Syndrome Education International) is a practising research psychologist at the University of Bristol, UK. The Numicon Kit 1 Plus Pack then supports the middle phase of the Numicon programme, and this currently costs £76 + VAT. The current final phase of the Numicon programme is supported with the Numicon Kit 2 Plus Pack @ £64 + VAT. Thus the current whole Numicon programme, taking the learner from the first introduction to basic number ideas through addition, subtraction, multiplication, division, and problem solving, would cost £256 + VAT to support an individual learner.